China Defense Blog: FC-1 equipped with WS-13 completed first successful runway taxi test. FC-1 equipped with WS-13 completed first successful runway taxi test. A big development indeed! Hopefully we can get a fully translated article soon to get some more info. 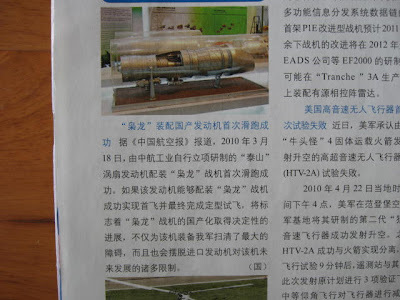 Its nice reading about a Chinese engine success than another setback and the faster the FC-1 can be completely idigienized, the more likely the PLAAF will consider it to replace its older aircraft. Those J-7II variants aren't getting any younger after all! I agree that equipping all current J-7 regiments with J-10 variants eventually would be the most effective upgrade for the PLAAF, but this depends on whether or not the PLAAF can afford to do such a thorough shift and instead take a more cost effective route, if such a high/low mix is chosen then the FC-1 is one of the leaders contenders for a low cost path for the PLAAF. Either way, the apparent success of the WS-13 is excellent news for Guizhou. The WS-13 general size and weight are nearly identical to the RD-93/RD-33. Many MiG-29s are still in the air amongst poorer countries in the world and Russian engines are notoriously short-lived. An upgrade program based on the WS-13 could be quiet lucrative for Guizhou. so far that is what the PLAAF are doing replacing J-7 regiment with J-10. China does have worlds largest account balance. An averages increase of budget with double digit, except this year. Two recent Sino-Japan relations related news. Chinese Military Equipment in Angola. 071 LPD to the Gulf of Aden. Reflections on the recent Thai crackdown. More on Sino- Indonesia military relations. PLAN’s Xia submarine to Pakistan?? Wanna buy an armored train? Chinese B-2B aims at export success. Rare photos of Type 69II in PLA service.